Get ready to get wild with quilting fabric that's going to add some real power to your next pattern. The Safari Fabric Collection from Quilting Treasures is without question one of the most valuable bundles of fabric you'll ever be able to work with. Animal prints are a hot trend in all things fabric, and they're all brilliantly recreated onto 100% cotton that's ready for anything and everything. You can add more bold detailing to a full pattern, give a quilt block an extra pop, or accessorize your wardrobe all with one collection. The beauty of this collection comes from its variety. Every kind of print has its own personality and look, so every quilter will find something they feel represents their personal style. The six prints also have two color variations, which gives you even more options. If you're a fan of cats and love that spotty look that so many of them have, then the "Cheetah" and "Leopard" prints will be what your eye immediately goes to. In both tan and gray, the exquisite realism not only presents a beautiful contrast between the spots and the rest of the fabric, but it will also give your quilt a high quality look with detailing that will surely draw people in. For those of you who prefer something more stripe-y, Quilting Treasures won't let you down either. You'll find two different styles in "Giraffe" and "Tiger", which present the elegant detailing within the print so beautifully displayed on the animals that inspired the collection. The impeccable choice in the color schemes (black, rust, and the additional brown for "Giraffe") create a compelling sense of energy that will make anything from a block to a border look even more outstanding. Lastly, there's the very textured look of "Snakeskin", which offers a gray, white, and taupe palette within a rustic-looking diamond pattern that again displays the impressive attention-to-detail this line offers. The Safari Fabric Collection is one of the top lines coming out now, and it's easy to see why. Everyone from animal lovers to those looking for an alternative to real fur will be truly impressed with the rare beauty of every one of these prints. Assuming I don't win - where can I buy a bundle of fabric like this? You can find information about the locations of Quilting Treasures fabrics on their site (http://www.quiltingtreasures.com/) or on sites selling their fabrics (https://www.fabric.com/Index.aspx). 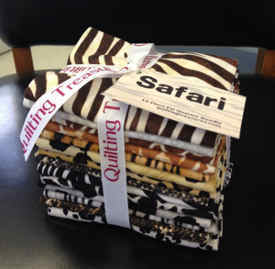 Oh, I would love to win the Safari fabric collection. I have been collecting different African prints for a quilt. This would be great for my quilt.